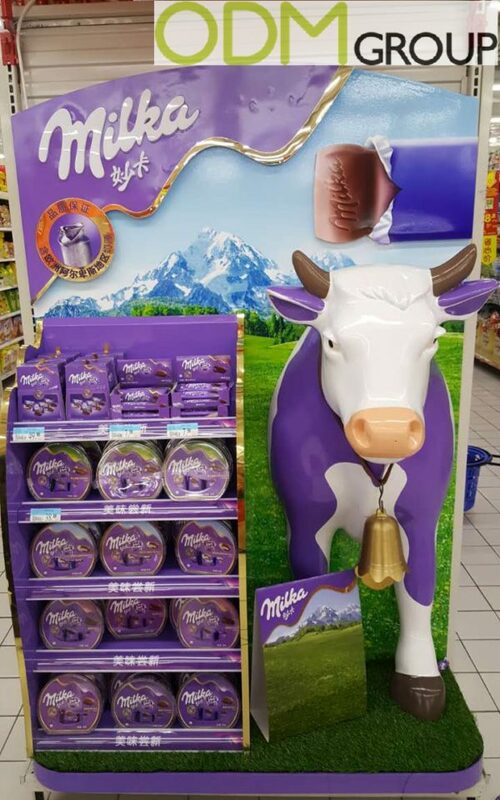 Milka is currently advertising with an original POS Display in China. They did advertised with a similar POS Display in the Duty Free Zone Dubai a few weeks ago. Milka has realized that advertising with a POS Display is always a good way to gain a lot of attention and to increase the sale of your products. Many brands promote their products with POS Displays, that’s why you should think about an original design for your POS Display. Such an original POS Display is great to gain a lot of attention and big sales through the whole campaign and even after. This design will especially catch the eyes of the children in the supermarket, who will try to convince their parents to buy some chocolate. But not only the cow is the highlight of this custom POS Display, also the green grass and this beautiful landscape in the background gives the customer a image of a company, which cares about the environment and gives the customer the feeling of doing something good, by buying this product. Why should you think about such an Original POS Display? Brand awareness. Such an POS Display is gaining a lot of attention to your brand and company and will not only increase your sales during the campaign, but also a long-term afterwards. Your current costumers and potential customers will take photographs with and of this cow. Attracts Customer. Not only current, but also potential customers will notice such an Original designed POS Display and will prefer your product over other ones. If you are interested in using a Original POS Display for your next marketing campaign, do not hesitate to contact us. Here at ODM we have years of experience with sourcing, designing and manufacturing promotional products for companies around the world. Please have a look on the related links below.